Welcome to C & M Cleaning Ashford & Kent – Carpet Cleaning Services for Home and Business. We believe in only the highest standards of cleaning, providing a professional and reliable service to our customers is our commitment – at very competitive prices. Professional Carpet Cleaning Services for the Home and Commercial premises. A Full range of Commercial Cleaning Services. A Complete and Thorough End of Tenancy Cleaning Service. More details about ‘carpet cleaning’ or our other services and our ‘pricing information’ can be found throughout the website. Please find contact information and a webform provided on the ‘Contact C & M Cleaning’ page, for carpet cleaning or ‘upholstery cleaning’ contact us to make a booking, for ‘end of tenancy cleaning’ please contact us for your quote or if you just have a general enquiry please feel free to get in touch – we would be happy to hear from you. Our Customers are important to us and for your peace of mind we use only uniformed staff that are fully trained and insured. At C & M we are committed to sourcing the newest and most effective equipment and cleaning solutions that are available, to maintain our high standards of quality and putting us in the position to provide the best possible results for carpet cleaning and upholstery cleaning. Results equal cleaner carpets! Please feel free to call us if you have any questions or use our enquiry form here on the website – all enquiries answered within 24 hours. 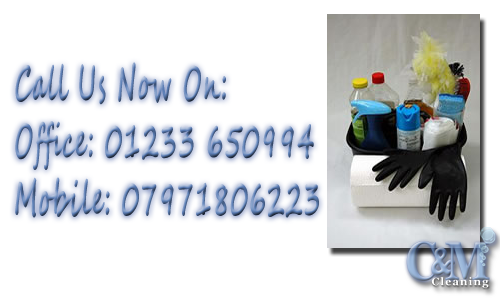 C & M Cleaning – Carpet and Upholstery Cleaners in Ashford & Kent. Many Thanks – The C&M Cleaning Team!